Can a Mini Stepper Help With Weight Loss? The mini-stepper is portable and convenient, which makes it ideal for a home gym and a quick cardio workout. Although it is not as effective as its larger counterpart -- the stair stepper -- the mini stepper can provide weight loss benefits similar to brisk walking. As with all forms of cardiovascular exercise, the amount of time and intensity you put into a workout affect how much weight you can lose. The mini stepper is manually operated and sometimes comes with a handle or resistance bands. To use the stair stepper, you put both your feet onto the foot pedals provided and perform a stepping motion similar to climbing uphill. Mini steppers allow you to adjust the tension for a more intense workout for weight loss. Some mini steppers also have an integrated calorie counter, which allows you to monitor your calorie expenditure. You can burn about 100 calories an hour using a mini stepper while watching television or working in an office, according to a study published in a 2007 issue of the "British Journal of Sports Medicine." The researchers note that the energy expenditure of a mini stepper is similar to brisk walking. You can burn more calories by using a mini stepper while standing up and holding dumbbells in each hand. This increases your overall mass and hand movements with the dumbbell, such as curls helps increase your level of exertion. 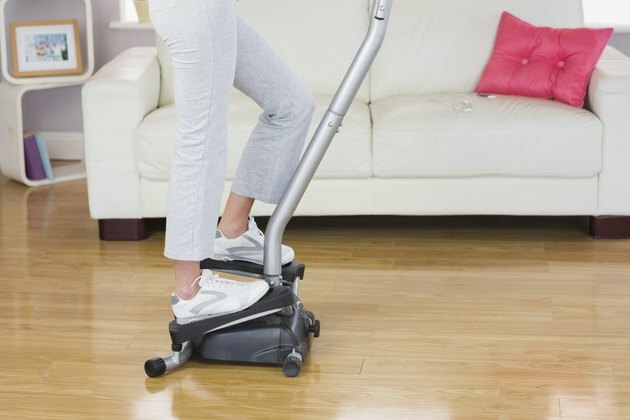 The mini stepper provides a low-impact, moderate-intensity workout. The low impact of the mini stepper allows you to work out for an extended period of time without straining your joints, unlike high-impact cardio like running. The Centers for Disease Control and Prevention recommends you get at least 150 minutes of moderately intense aerobic exercise weekly. Therefore, you need to use the stair stepper for 30 minutes a day for improved cardiovascular health and calorie expenditure. Since the mini stepper is portable, you can take it to work and exercise for 10 minutes, three times a day. A mini stepper can only help with weight loss if you consume a healthy diet. To lose weight you have to burn more calories than you consume. The most efficient way to do this is replacing processed foods while whole foods such as seafood, brown rice, vegetables, fruits and lean meat. The mini stepper can help you achieve the minimum amount of aerobic activity for improved health but for faster weight loss results, consider performing vigorous exercises such as playing basketball, running and swimming laps. What Is a Stair-Treadmill Ergometer?